Beef is in again. After years of thinking of it as simply bad for us, many Americans have changed their minds about the healthfulness of red meat and meat in general, and we are eating more beef, pork and chicken than ever before. Steak even has a new health halo. ­Nutrition bloggers and best-selling ­authors promote low-carb, high-fat diets that emphasize meat, and popular ­“paleo” diets aim to mimic the way our hunter-gatherer ancestors ate—the idea being that if they ate lots of meat, it must be what nature intended. Bottom Line: Our Paleolithic ancestors ate meat every chance they got, so why can’t we? Dr. Katz: Remember that expression, “You are what you eat?” It’s also true that we are what the animals that we eat ate. Our ancestors ate the flesh of animals that ate a native diet of whole, wild foods. That’s very different from the flesh of most animals raised by the food industry today, which are fed things that are not native to them—grains or ground-up bits of other animals. So we may be adapted to eat meat, but what kind of meat are we adapted to eat? There was no Paleolithic grain-fed beef or pepperoni! A typical cut from a grain-fed steer gets about 35% of its calories from fat. Much of that fat is saturated—and despite what you may have heard or read, replacing saturated fat with unsaturated fat, especially polyunsaturated fat, will reduce the risk for cardiovascular disease. One polyunsaturated fat in particular is very good for your heart and brain—omega-3 fatty acids, the kind that typically is found in fatty fish. That grain-fed steer has no omega-3 fatty acids at all. 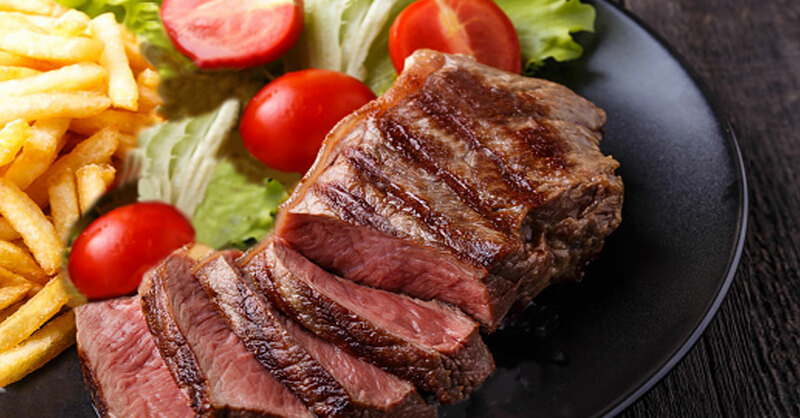 By contrast, steak from a wild antelope not only has almost no saturated fat, but it supplies a significant amount of omega-3s. Both conventional grain-fed beef and wild game are technically “red meat” and both provide protein, but they are radically different foods. The wild game is much more healthful. So should we be eating wild game instead? Actually, if we could, yes. The closer your meat is to free-ranging wild game living off a variety of wild plants and getting the exercise they need, the better. The next best thing is bison—a domesticated wild animal that feeds on grass, not grain, and also is free to range. And the next next best thing is free-range, grass-fed beef. Grass-fed beef not only has less saturated fat than grain-fed beef and a meaningful amount of omega-3 fats, it’s also less likely to lead to serious food-borne illness outbreaks. For example, E. coli 0157:H7, the bacterium that contaminated romaine lettuce this past spring, is a mutation of E. coli that forms in the gut of conventionally raised cattle because grains change the pH of these animals. What about organic meat? Is it healthier than conventional grass-fed? It may not be. Organic means that no hormones or antibiotics are used on the cattle, but the cows still can be confined to a feed lot but fed organic grain. We have no meaningful evidence proving or disproving the health benefits of organic meat, but we do know that grass-fed meat is more healthful for you. It is best to choose meat that is both organic and grass-fed—but if you have to choose one or the other, choose grass-fed. What about research said to show that eating red meat makes the plant-based Mediterranean diet healthier? There was a study sponsored by the beef and pork industries that purported to show that—but they didn’t compare no-meat, low-meat and high-meat versions of the Mediterranean diet, which is the right way to do such a study. They just compared similar amounts of red meat with poultry. There wasn’t much difference. Can the healthy, plant-based Mediterranean diet include some red meat? Of course. We already knew that. Is bacon really as carcinogenic as smoking cigarettes, as many headlines have said? Not at all! The scientific evidence for the cause and effect is strong for both—which is where these headlines come from—but the degrees of risk are very different. In other words, it’s much less likely that eating bacon will give you cancer than that smoking cigarettes will give you cancer. In general, carcinogens in a reasonable diet make only a modest contribution to overall cancer risk. Processed meats—bacon and hot dogs, as well as lunch meats and ­pepperoni—often are cured in ways that add nitrates/nitrites, which are carcinogenic. So if you are going to eat some processed meats, it’s worth finding ones that are not cured with these food additives. I still would limit the amount of processed meats to once or twice a month. So given all this, if a health-conscious person wants to eat steak, burgers, pork chops and other red meat, how much is OK? I would limit myself to no more than two three-ounce servings of red meat each week. I recommend a similar limit on poultry as well—so out of the 21 meals in a week, no more than four are beef, pork, lamb, chicken or turkey. Most of the longest-living people in the so-called blue zones—in Sardinia, Italy, for instance, or Ikaria, Greece, or Okinawa, Japan—eat meat occasionally, as part of a Friday night meal. But during the week, beans or lentils—and sometimes seafood—are their primary protein sources. What if I don’t want to go that far but just cut back? Is there a proportional improvement in health? If red meat is on your plate at nearly every meal, stop eating it at breakfast. Breakfast meats tend to be fatty, processed meats anyway. Next, go meatless at lunch several times a week—or every day. For dinner, have a small portion—with plenty of vegetables and whole grains. Consider meatless Mondays. Then see if you can go without eating meat for the entire day two or three times a week. Once you make these kinds of ­changes, you may well see a decline in blood pressure, weight and cholesterol…an improvement in blood sugar, insulin levels and inflammatory markers such as CRP…better digestive health…and more energy. It’s also much healthier for the planet. It’s up to you whether that’s all worth eating less meat or none at all—it is to me!